I wasn’t at RootsTech 2019 last month, but I did take advantage of the free videos that were available for live streaming during the event and are accessible even now on the RootsTech website. Since we’re all about life stories and personal history around here, I decided to offer up a few of my favorite takeaways related to those topics from four speakers. If they whet your appetite for more, you can always watch the full videos of these speakers and discover others focused on genealogical research, DNA testing, and online record searches. He is not a scientist, but he is eager to shed light on how amazing much of the science behind story really is—from triggering the release of cortisol (which commands our attention) to the eventual release of oxytocin (which he says “makes us more receptive to empathy, to caring”). If you are interested in this, I suggest watching Curt’s entire portion of the video, which begins at the 20-minute mark. Is there anyone among us who does not?! Ah, yes, be patient, and listen generously! 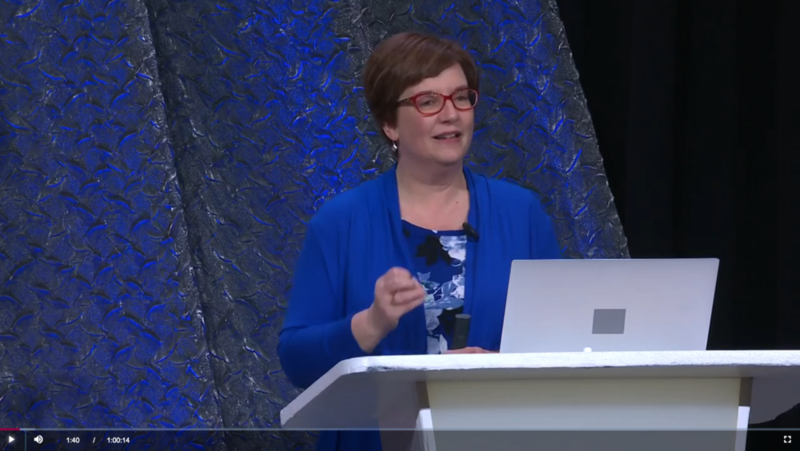 Genealogy coach Janet Hovorka speaking at RootsTech 2019. Janet offers up six concrete questions to ask yourself about your family history stuff in trying to decide whether (and how) to save it or to toss it. If this is something you are facing, whether due to the recent loss of a loved one or to the ever-expanding hoards of your own family history documentation, then definitely give her video your full attention. Facebook and FaceTime may bring us closer to far-flung relatives, but it’s no substitute for in person togetherness and for regular story sharing—especially of the impromptu kind. Which part of your story will you tell first, I wonder…?